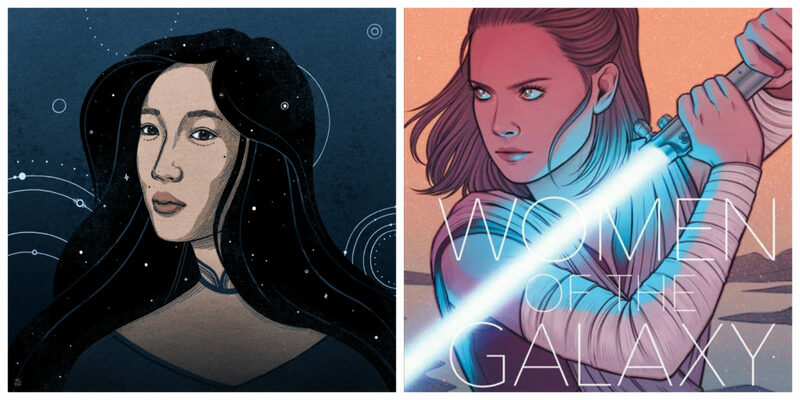 Self-portrait by Christina Chung (left) and the cover of Star Wars: Women of the Galaxy (right). Christina Chung is one of the artists from Star Wars: Women of the Galaxy. She was kind enough to answer a few questions via email for 365 Days of Star Wars Women. What was your introduction to Star Wars? Were you a fan before you were hired as an artist for Women of the Galaxy? If so I’d love to know if you have a favorite film/TVshow/character. My introduction to Star Wars was, as it was for many children of the ‘90s, the prequels. It wasn’t until watching the original trilogy when I was much older, and especially after the newest films of recent years that I began to call myself a fan. My favorite character is definitely Rey, but Rose Tico holds a special place in my heart as well. Rose Tico fanart by Christina Chung. 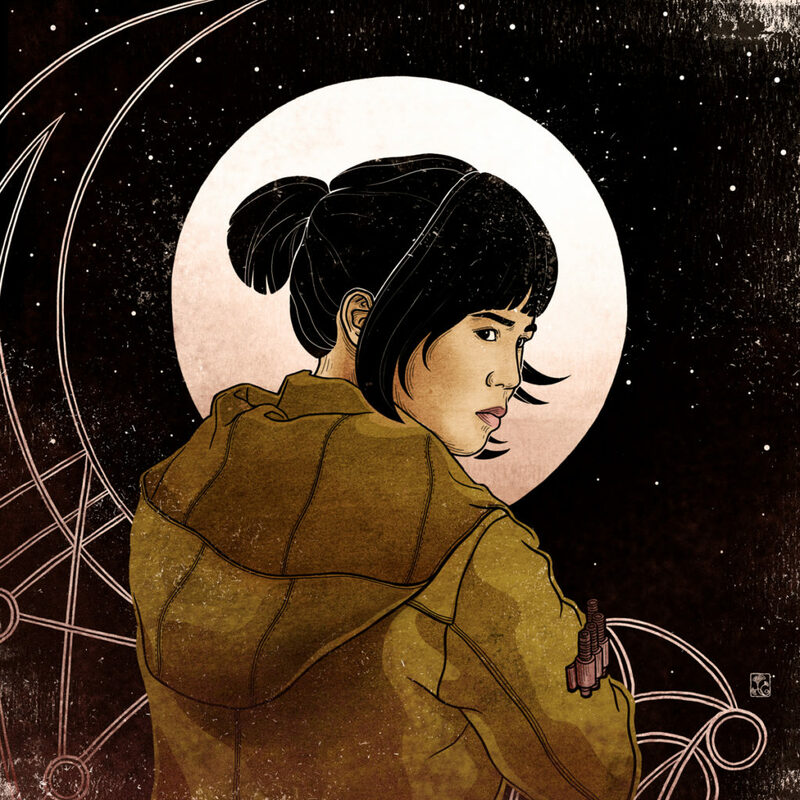 You have a fantastic Rose Tico illustration on your Instagram, have you done a lot of other unofficial Star Wars art? What inspired you to draw Rose from The Last Jedi? My portrait of Rose has been the only unofficial Star Wars art that I’ve drawn to date. I started working on it immediately after watching The Last Jedi because her character just meant so much to me. I felt I had to pay tribute to her in some way. Growing up in America as a child of Taiwanese and Hong Konger immigrants, I almost never saw faces that looked like mine in mainstream media. The stories on screen and in the pages of books were not my own. But this was the reality I was accustomed to, so I never knew that I could ask for more. It’s characters like Rose Tico, a strong, multi-faceted woman of Asian descent far beyond the confines Hollywood’s stereotypes, that finally showed me that representation matters. I left the theater feeling validated and empowered. It wasn’t until I began to see faces like mine on screen that I realized that I didn’t always have to try to relate to someone else’s story–stories of people like me are worth being told as well. Representation expands our worlds and adds color to the fabric of society by presenting different stories and experiences, all of which are valid, compelling and worthy of being shared. This is one of the reasons why being a part of Women of the Galaxy means so much to me. How would you describe your art to someone who hasn’t seen your work before? I would describe my work as conceptual and narrative illustrations. I love playing with line and patterns to create beautiful pieces, but above all, it’s most important to me to tell a story. I especially like to illustrate plants, sci-fi and fantastical images with a focus on diversity in my characters. 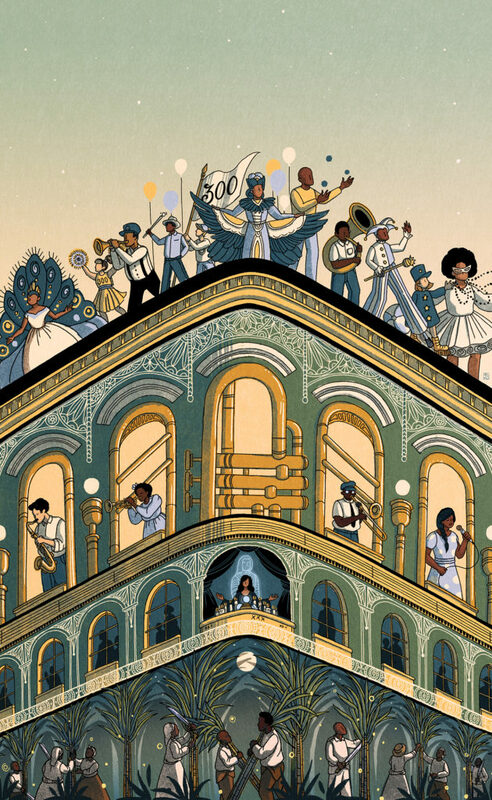 Cover for the Travel section of the Washington Post, celebrating the tricentennial of New Orleans by Christina Chung. You have some really striking illustrations that have been used as covers for magazines and books. Is your process different for works that you know are going to be used as cover art? I’m curious how much information you are given about the magazine articles or books before you create your illustration. When working on cover art, I want to make sure that it not only captures the attention of the viewer, but also captures the essence of whatever it is the cover is for. The amount of information I’m given when working on a prompt can vary from full manuscripts, drafts to simply an idea. Did you have any input in which characters you would be illustrating for Women of the Galaxy? Did you look at other illustrations of these characters before you started your own illustrations? We were assigned our characters for this project. My very first assignment was Rey. Funnily enough, I received the email telling me so while I was watching The Last Jedi in theaters and falling in love with her again. Needless to say it was an exciting, though intimidating, surprise! 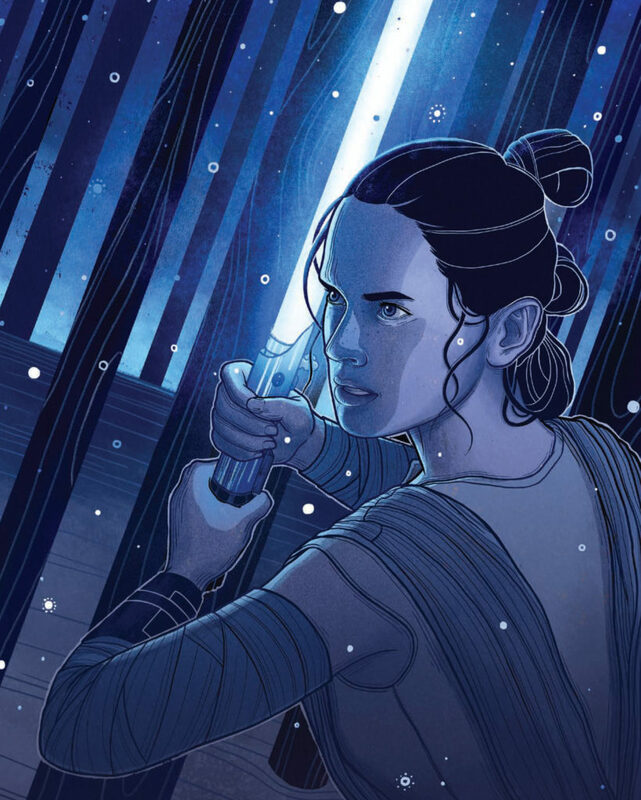 Illustration of Rey from Star Wars: Women of the Galaxy by Christina Chung. For each assignment I researched every character by watching the films and series episodes that they appeared in as well as reading up on any backstory that they had. Working on this project introduced me to several of the characters that I illustrated, as I hadn’t watched the animated series prior, so I definitely came away with a lot more knowledge of the vast Star Wars universe. Do you have any favorites of the artwork you have seen from the book? The entire book is absolutely phenomenal, but if I were to choose some favorites, it would have to be Sarah Kipin’s Ahsoka Tano and Eli Baumgartner’s Norra Wexley. Can you talk about any projects you have coming up? Most of my upcoming work is under NDAs, but I can talk about a book that I illustrated the cover for coming out in March of 2019. It’s called ‘The Broken Circle: A Memoir of Escaping Afghanistan’, and is written by Enjeela Ahmadi Miller. It’s an epic and emotional memoir and I’m really excited to be sharing a full reveal soon! You can find more of Christina Chung’s work on her website, Twitter, and Instagram.